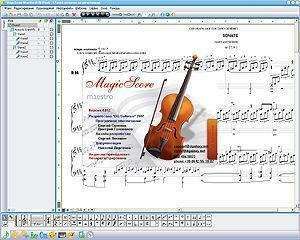 MagicScore is a magnificent, powerful and convenient musical editor, for those who professionally are engaged in music. Advantages of MagicScore: The convenient interface for a set of partitas, some variants of data input by means of the virtual keyboard, external MIDI devices and big set of musical symbols. Automatic and manual formatting of partitas. Reproduction and a seal of the partita. MagicScore Classic 4.196 is a shareware program and can be used as a demo to try the software until the free trial period has ended. A full version of the program is available after the trial period ends. For security reasons, you should also check out the MagicScore Classic download at LO4D.com which includes virus and malware tests. Additional screenshots of this application download may be available, too.